A successful crowdfunding share issue speeds up the market entry for Injeq IQNeedle™ in Europe. Injeq backed by investors has today announced an expansion of clinical trials to three leading University Children’s Hospitals in Denmark, Norway and Sweden. “International studies are an important step in demonstrating the benefits of Injeq IQ-Needle™. We are happy and honored to enter research collaboration with leading Children’s hospitals in Scandinavia. Preparations and planning for new studies has now been started”, says Dr. Rami Lehtinen (PhD), VP Clinical Development & Sales, Injeq. “As pediatric oncologist, I appreciate this development and want to test the Injeq IQ-Needle™ product in a clinical trial in Rigshospitalet. Pediatric ALL (Acute Lymphatic Leukemia) patients are treated with repeated intrathecal chemotherapy injections. In this patient group, traumatic lumbar punctures, indicated by blood contamination of spinal fluid, are especially problematic, since those may introduce leukemia cells from blood to the central nervous system.”, says Dr. Thomas L. Frandsen (MD, PhD) from the Department of Pediatric Hematology/Oncology in Rigshospitalet, Copenhagen University Hospital, Copenhagen, Denmark. “We are keen to test the Injeq IQ-Needle™ product in clinical trial in Haukeland as soon as possible. This new needle can be expected to improve the success rate and reduce trauma and bleeding in newborn and in children lumbar punctures”, state Dr. Hallvard Reigstad (MD), Head of Neonatology Department and Dr. Maria W. Gunnes (MD, PHD), Pediatric Oncologist, both from Haukeland University Hospital, Bergen, Norway. Karolinska University Hospital, Stockholm, Sweden is also committed to pursuing clinical trial in the patient group of prematurely born infants prescribed to a lumbar puncture. 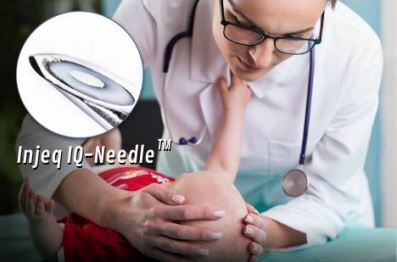 The Injeq IQ-Needle™ immediately alerts the physician as the tip of the needle reaches its target which is the spinal fluid. This functionality should help the physician to avoid excessive needle penetration and related complications. Excellent results have previously been recorded in clinical trials in Finland. Injeq is a medical device company based in Tampere, Finland. The company is devoted to developing bioimpedance based tissue identification and it has announced the first product currently in clinical trials; Injeq IQ-Needle™ equipped with electrodes and Injeq BZ-301 analyzer for advanced real-time information. The technology can be applied for multiple clinical applications, including regional anesthesia, lumbar punctures, biopsy and intratumoral drug delivery. The products are expected to benefit the patients by improving diagnosis, reducing complications and enabling new type of treatments. A financial technology (fintech) company founded in Finland in 2012, Invesdor operates an online investment platform that connects ambitious European growth companies with investors worldwide. So far Invesdor has helped raise morethan 30 million euros and hosted more than 80 successful equity crowdfunding campaigns. Invesdor’s clients includeprivate and publicly traded companies from Finland, the UK, Norway and Denmark as well as investors from more than 70 countries. Invesdor has offices in London and Helsinki. Invesdor is the Nordic market leader in equity crowdfunding platforms measured in invested capital in 2016.